“Quite a Ride” turned out to be a Saul Goodman quote to his secretary, who may as well have been his fixer as he attempted to escape the complete garbage fire his life and work became at the tail end of Breaking Bad. It’s one of the first times we’ve ever seen Better Call Saul show us something from that timeframe, but as we’re four seasons in and AMC has already green lighted a fifth, eventually these two timelines have to intersect in more than one proximity. Thus, within the episode, we saw the beginnings of Gus building what would become Walter White’s private meth laboratory underneath the front business, and we watched as “cool and calm” wasn’t what Gus and Mike Ehrmantraut believed was right for the job. The first structural engineer said he could do it in six months, was uber confident, didn’t care about the bumpy ride, didn’t take the bottle of water, and used a high tech instrument to get to his conclusion in about a minute of actual time once he was on site. Later, we see an older gentleman that was fidgety and nearly got motion sick, who drank water like he’d never had it before when it was offered to him, and once he saw the site, he broke out a notepad, turned over every nook and cranny and assessed its difficulty to the project, and never even laid out the timetable. He simply said that while it would be incredibly difficult, expensive, and so many things could go wrong, it wasn’t quite impossible. And Gus grinned, shook his hand, and that was that. In this moment, we saw that Fring can spot the quality of authenticity in a person, doesn’t want things to be sugarcoated, and instead wants someone that will be real with him about what’s to be done and how it should be done. After all, Gus, in addition to being a psychopath and a mass killer and a drug smuggler, is also a businessman and a fast food manager. This hour was largely about business, and more importantly it was about the personal philosophies we all develop about our own professional lives, and the trial and error, but also about what we learn about ourselves through the triumphs and the failures. Both were on display in spades during “Quite a Ride,” as we saw Jimmy attempt to move the burner phones in a shady part of town in a dope track suit. He was successful, because of course he was, but by the end of the night, he was battered and bruised by three lowlife teenagers that mugged him and took every cent he made during the hustle. His response to his PPD officer was telling, when he was matter of fact about his plan to get his law license back in nine months and to be a “damn good lawyer” that people would know was formidable. His experience in that parking lot led him to clean all of the “Privacy” paint off the CC Mobile windows and reevaluate his choice. “What is wrong with me,” he asks Kim as she helps him that night, and he suggests he should call the psychiatrist. But, he doesn’t, not after running into Hamlin in the court restroom and seeing what “two times a week” with a shrink has done for that guy. Kim is still on her altruism kick, and she’s learned the person she seeks to be in this world, and as such she blows of Mesa Verde in a moment she’s needed desperately to fix a key paperwork mistake. She did it in order to get a first time drug offender client in court, probably to make very little money on the gig, but to do the part of her job that fulfills her in some way. It didn’t cost her Mesa Verde, but we’re on that pathway, and we can see it happening. You have to wonder when that sentiment will apply to her lover and friend and not just an ungrateful idiot client. She’s giving Jimmy ice and putting alcohol on his wounds and taking care of him as she usually does, but when he goes down the low road one time too many, “I’m not going to do a damn thing about it next time.” More accurately, she won’t be around to do anything about it next time. This was a deep episode about the mental character of these people in this universe. It’s about what’s brought them to the place they find themselves, and it’s also a glimpse into the future for many of them. Mike hasn’t completely sold his soul yet, but he’s close. Jimmy hasn’t either, but he uses every setback as an excuse to fall into his old ways. Kim is trying to buy back her soul, at least in her own mind, and she’s growing further and further apart psychologically from nearly everyone else on the show. Nacho might be the closest to her at this point, because he was also trying to get out. And couldn’t. At least not yet. Probably not ever. It was a good hour and a fun one watching Jimmy try to move those cell phones, even to the paranoid guy that leaves with a stack of “spoken for” burners after Jimmy gives him the full pitch, including the “On Hold, Do Not Sell” note on top of them to make it look like business is booming. 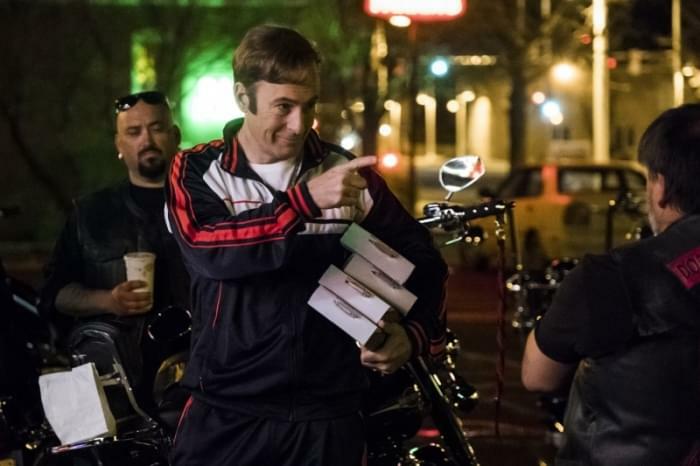 The track suit metamorphosis at the nail salon was subsequently funny, and it was fitting that after succeeding, Jimmy McGill ended up beaten on the payment, robbed blind. Every time he takes a step forward in his life, especially when he tries on his own to do something his way, somehow he ends up five steps in reverse when he wakes up. We’re midway through a terrific season of Better Call Saul. AMC screeners stopped two weeks ago, which explains the delay in these reviews. If the network begins providing them again for critics, we’ll be back on the old “as the credits roll” schedule. If not, I’ll have these next day for you. I’m @JMartZone. You can’t play chicken with me. I invented chicken.